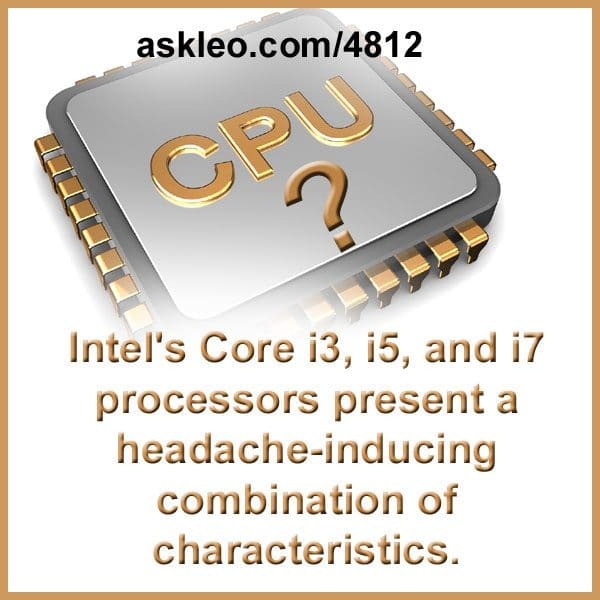 Intel's Core i3, i5, and i7 processors present a headache-inducing combination of characteristics. - Ask Leo! Intel’s Core i3, i5, and i7 processors present a headache-inducing combination of characteristics. Should I get a dual core or a quad core processor? - Processors are generally available with what are called "multiple cores". We'll look at what that means, and how you might select which is right for you. Why is only one core on my multi-core processor being maxed out? - You may have a multi-core processor, but not all software can utilize more than one core. The Four Characteristics of Computer Speed - A friend's slow computer provided an opportunity to review the four primary characteristics of computer slowdowns. What’s the difference between i3, i5, and i7 processors? - Intel's Core i3, i5, and i7 processors present a headache-inducing combination of characteristics. I'll look at what matters and then dig a little deeper. « Previous post: Browser problems can be caused by any number of things that may or may not actually include the browser itself.